Secret Cinema organisers have announced additional dates for ‘Secret Cinema presents Back to the Future’, after 42,000 tickets to the shows running between 24th July – 10th August sold out on Thursday 5th June 2014 just 4 hours after going on sale, with 34,000 tickets selling in the first 20 minutes and nearly 17,000 tickets selling in the first 4 minutes. The ticket sales are not just unprecedented in terms of numbers, but also in terms of the scale of tickets sold geographically, with 22,000 tickets purchased in London, and 20,000 across the rest of the UK and abroad. 1.5% of overall sales were outside the UK with tickets purchased from as far as Brazil, Afghanistan, Bermuda and Cameroon. Tickets for the additional dates between Thursday 14th August – Sunday 31st August will go on sale at 1pm on Wednesday 11th June. ‘Secret Cinema presents Back to the Future’ will be the biggest live cinema event ever staged in the world and is set to be the most epic and detailed production to date. ‘Secret Cinema presents BACK TO THE FUTURE’ will run from 24th July – 10th August and 14th – 31st August 2014. The show will be the accumulation of close to 45 large scale cinematic productions before Secret Cinema takes the concept global in 2015. Secret Cinema will build the town of Hill Valley in a secret London location and transport audiences into a richly detailed imagined world. Audiences will travel back in time and become citizens of Hill Valley living between 1955 and 1985 with secret alleys and entrances in the town that will allow them to travel to 1985 and 2015. As in previous productions such as Dirty Dancing, Grease and Top Gun – this event will follow the familiar interactive format of immersing audiences into the world of Back to the Future and Hill Valley in the first half of the evening followed by a screening of the classic 80s film alongside extra experiential surprise elements. ‘Secret Cinema presents Back to the Future’ marks the transition from Future Cinema into Secret Cinema. Secret Cinema Tell No One where both the film and the location is kept secret will continue as a separate strand. The show will be open to everyone aged 5 and/or older. Children under 16 must be accompanied by an adult. 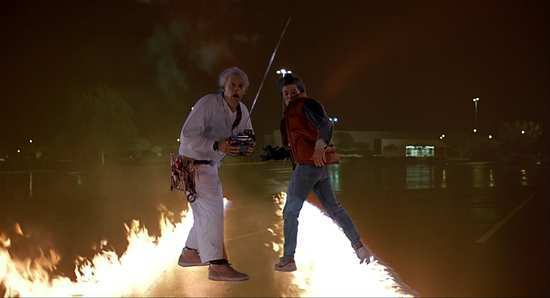 Back to the Future (1985) PG: The film is suitable for general viewing, but some scenes may be unsuitable for younger children. A PG film should not unsettle a child aged around eight or older. Parents should consider whether the content may upset younger, or more sensitive, children.